Your cell phone can now help research climate change, hunt for pulsars, or design new AIDS drugs, thanks to a new app from UC Berkeley. The app, called BOINC, has been available for desktop computers for more than a decade. It allows users to lend their spare computer power to international science projects, such as the popular SETI@Home, which scans radio signals from space to seek out extraterrestrial intelligence. I asked Anderson, what changed? "What changed was the notion of being able to run apps, which was pioneered by Apple and picked up by Android," he said. "People started running apps that did complex things: games that were fast and had complex graphics." Instead of using your cell phone to send texts and make calls, which doesn't really require that much computing power, all of a sudden, the more computing power you had on your device, the better and faster the apps performed. So what is BOINC? Is it an app? BOINC is what we call "middleware.” It’s a layer of software that lets scientists run their scientific applications on peoples' home computers. It takes care of a lot of details, for example, making sure the computation runs in background, so it doesn't slow down the performance of your computer (or your phone, as the case may be). And it takes care of other things, like validating the results. So if someone’s computer makes a mistake, it doesn’t interfere with scientific results. Traditionally, the way to get computing power is to either buy your own computers or rent time on a supercomputer. Many scientists either can't afford that or simply need more computing power than is available that way and that's why they use volunteer computing. 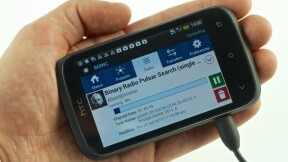 So, now BOINC can run on Android phones. Why only Android? Android is based on Linux, which is a very popular open source operating system. So to get BOINC working on Android, mostly it worked out of the box, though we did have to develop a new graphical interface for it. We hope iPhones are a possibility in the future. But they’re not based on Linux, like Androids are. There are also a few legal difficulties, because there's a rule for iPhone apps that they can’t download other applications. And what BOINC does is it downloads science applications from these projects and runs them. So we'd have to work out those details. I think if the Android version is successful, we may look at iPhone in the future. What can people do with BOINC? Einstein@home is a project from Germany that's looking for new pulsars – which are a kind of exotic astronomical object – by analyzing data from a radio telescope. A second project is called IBM World Community Grid. The science that they're doing with Android is called virtual drug design, which is doing molecular simulations to see how various chemical compounds interact with the proteins that are found on, in this case, AIDS viruses. It's a way of looking for potential drugs to fight AIDS, using computers. There are scientists in virtually all areas of science that are using volunteer computing. There are people who are studying long-term climate change, astronomers who are studying asteroids that might collide with earth, among other things. Pretty much anywhere there’s science that needs a lot of computing power, there are people using volunteer computing to get it. I think very shortly there's going to be quite a range of applications you can run on your Android phone. Any idea how much potential computer power we’re talking about? If we can get things up into the range of a million mobile phones, we will have doubled [BOINC’s existing] computing power. And that sounds like a lot, but there are currently about a billion Android devices out there in the real world, and the number is increasing really fast. There will probably be two or three billion in a year or two. If we can get a tiny fraction, even a tenth of a percent of people willing to do science on their phones, that'll give us very meaningful computer power. Nobody can guarantee we're going to find an AIDS drug, but we potentially could.